This issue begins with political theorist Alexandre Lefebvre’s demonstration of Mary Wollstonecraft’s defense of the human rights in terms of “care of the self” rather than protection of others. It continues with two intrepid forays into twentieth-century international history by Lorenz Lüthi and Stuart Schrader. After turning to Michal Givoni’s brilliant and sensitive evaluation of a contemporary development in humanitarianism, the issue closes with four rich review essays, among others Simon Stevens’s pathbreaking assessment of where we stand in understanding the international mobilization against South African apartheid, and Pamela Beth Harris’s hard-hitting review of Stephen Hopgood’s much-discussed The Endtimes of Human Rights. 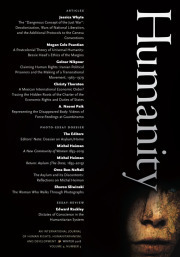 Toward a New Sociology of Human Rights? The Laws of War: A Scrap of Paper?